Every once in a while, I do find myself coveting satellite radio, especially in my car. My dad has a couple of XM players: one in his car, and one that bought him for the living room last year, and he gets plenty of use out of both. And while displaying information about the track and station on the player is quite the step up from conventional radio, he still has to walk over to the unit to see what it is. Sirius's Conductor, available in November, aims to make that a thing of the past by including a small display on the remote itself which tells you the name of the track and station that you're listening to. Better yet, it transmits via RF, meaning that it's not limited to operating in line-of-sight like traditional infrared (IR) remotes. 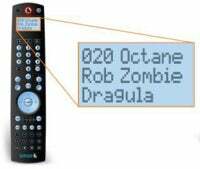 It also works as a 6-in-1 universal remote control for managing your whole home theater setup; IR blasters are included to relay commands to your other equipment. All for the low low price of $150. When I finally get around to investing in satellite radio, this'll get a serious look.